FIND THE MISSING. FEAR THE FOUND. Three months have passed since the space fleet's arrival, but very little has changed in the skies above planet Earth. Motherships still hover without word, impervious to attack and communication. Spherical shuttles still ferry about, their intentions unclear. But the abductions of select humans have ended and most of those taken have been returned -- dazed, incoherent, and prophesying glory or doom -- but back home where they belong. All but nine. Worldwide, only nine seemingly unconnected people remain missing. Trapped in their besieged bunker outside Vail, Piper, Trevor, Lila, and Heather wait for one of them. For his entire life, Benjamin Bannister has sought the connections that unite the planet's wonders: Egypt's pyramids and Stonehenge, the Band of Holes in Peru and the Cambay Ruins. For years he's pursued evidence that extraterrestrial life is not new to Earth, but has left its footprints in the archeological records over and over again. For years, he was dismissed as a fool. But now the spheres have arrived and Benjamin has found his vindication … along with troubling theories as to what it all means. Benjamin's research facility rests on a paranormal hotspot in Moab, Utah -- but Vail, Colorado is where his interests lie. He's sent an emissary to Meyer Dempsey's ranch to find the answer to a question: What makes the Missing Nine so special to the planet's silent invaders? What news will those Nine bring when they return? And what, as the motherships again begin to move like pieces finding positions on a chessboard, will happen next? …and it will all happen again. Vail and Moab, Moab and Vail -- two epicenters in the cold alien war. The locations' fates (and the fates of those bunkered at each) seem somehow intertwined as Earth's clock ticks toward midnight. The roads and communications have been closed, but now it seems that the planet's future might depend on a journey from one to the other at all costs. Humanity must find the value of those who have been taken … or become mere fossil evidence for the archaeologists of the future to puzzle over. 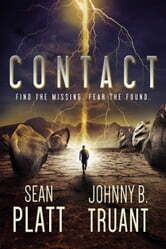 This relentless, page-turning tale of first contact is the second in the Alien Invasion series by masters of story Truant and Platt, authors of The Beam, Robot Proletariat, the Dream Engine series, and many more. The first book really caught my imagination but the second was a wow. Good character development and a good mystery to unravel. Am about to start the third book. Kudos to the authors. Design of bunker was interesting but characters were not appealing. Relied upon a lot of standard science fiction theories. 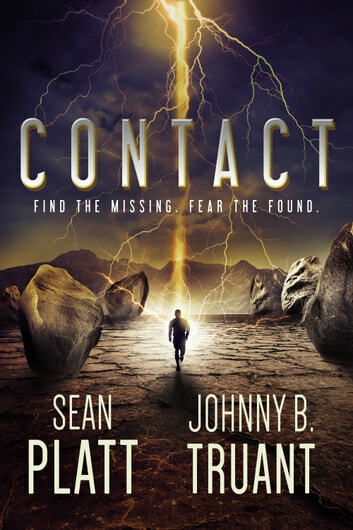 A good followup to Invasion, Contact takes place 3 months later and follows Meyer's family as they try to live without going crazy inside of the bunker, and the crowds of people attracted to Meyer's house because he was abducted there in the hopes that they might be abducted too. (Lots of hippies.) Not is all sunshine and rainbows, though, as some of the crowd have discovered the bunker, and are trying to break in... I enjoyed the new characters and relationships introduced in this book, and like how nobody is safe from danger. That said, this book is not quite as "page-turney" as the first book, owing in large part to a lot of the action taking place in a very confined space. There is a bit of travel as a few of the main characters try to find a secret research base in Utah and to travel there from Meyer's bunker without getting killed, but it wasn't just one life-threatening event after another as folks tried to cross the country from NY to CO like the first book. Meyer himself plays a very small role in this book, although given how the book ends I expect that he will play a much larger role in the third book. While I didn't tear through this one nearly as fast as I did the first book, I am still eagerly awaiting the the next book. The authors continue to please. The story and characters are satisfying. The alien connection with past human history is believable in the context of von Danikan's theories and his successors. I look forward to reading the next volume. You should, too. The first book was promising but the second didn't take the story far enough - disappointing in that. I was close to dropping it and moving on to something else but wanted to give it a chance - I will likely get the next one but if it's similar I'll end my relationship with these authors unfortunately.